Recently one of our followers on Twitter asked us about the Taylor Slate so we decided to feature it in this column. The first photo shows the slate, itself, with this description: “The aluminum Taylor Slate has an 18 x 24 grid of star-shaped holes and a tray to hold types.” The second photo shows a key to represent how rotating the types lets you represent all ten digits and the operatives. The full description is below. The description from Museum Director Micheal Hudson is below. Quick Tip: Teaching Spatial Concepts with Picture Maker. The Picture Maker Wheatley Tactile Diagramming Kit is one of APH’s most versatile products, and can be used for many activities - one being to teach spatial concepts. Countless websites and newsletters provide online coupons and promo codes for saving money at stores and websites. One of these sites is https://www.couponchief.com/. 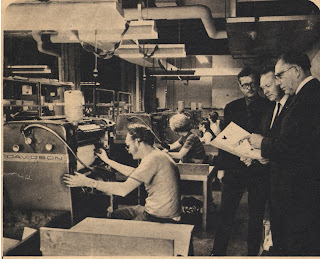 You may browse the site at your leisure. We mention CouponChief, however, because one of its employees sent us a Retail Savings Guide for People with Disabilities which it recently developed. The site already produced savings guides for women, veterans, and seniors. The savings guide for people with disabilities is general in scope and is not tailored to people who are blind or to any other particular group. That being said, people who are blind and visually impaired certainly may benefit from the guide. The following article was sent to us by someone who made adjustments to her home to accommodate a relative with low vision who moved into the home. We will include a bit of background information provided by the author, her article, and three resources she mentions in it. You may add comments offering other suggestions if you wish. The specific accommodations will vary depending on the type and size of the home; nevertheless, this article provides a detailed description of what one family did to modify aspects of their home to assist a visually impaired relative who came to stay in that home. Here is her information and story. My name is Jackie Waters, and I am a mother of four beautiful and energetic boys. I live with my family on our three acre hobby farm in Oregon. 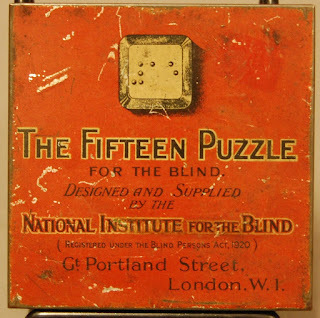 Our object this week is a braille sliding puzzle from England, probably around 1920 or so. The goal was to arrange the fifteen game pieces, each topped with a braille number, into consecutive order, without lifting a piece from the bright red tin box. The pieces are arranged in a four by four grid with one space left empty. Like all sliding puzzles, you could only shift one piece at a time. Probably not as easy as it sounds. 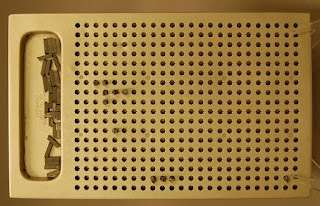 The square pieces are cast out of an early brown plastic called Bakelite. Sliding puzzles were the Rubik’s Cube of the late nineteenth century, introduced commercially by a Boston woodworker named Mattias Rice.